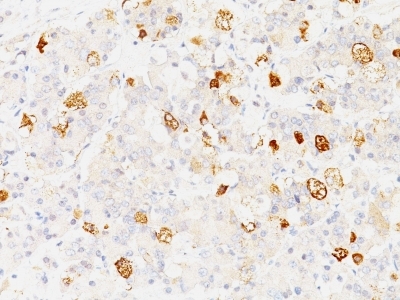 This MAb reacts with a protein of 22kDa, identified as beta sub-unit of FSH. It does not cross react with the alpha sub-unit. Follicle stimulating hormone (FSH) is a hormone synthesized, secreted by gonadotrophs in the anterior pituitary gland. In the ovary, FSH stimulates the growth of immature Graafian follicles to maturation. As the follicle grows, it releases inhibin, which deactivates the FSH production. In men, FSH enhances the production of,rogen-binding protein by the Sertoli cells of the testis, is critical for spermatogenesis. FSH, LH act synergistically in reproduction. FSH is a useful marker in the classification of pituitary tumors, the study of pituitary disease. 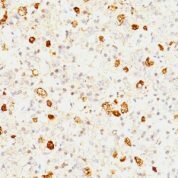 Variations in FSH-beta antibody staining intensity in immunohistochemistry on tissue sections are present across different anatomical locations. An intense signal was observed in cells in the anterior in pituitary gland. More moderate antibody staining intensity was present in cells in the anterior in pituitary gland. Low, but measureable presence of FSH-beta could be seen in. We were unable to detect FSH-beta in other tissues. Disease states, inflammation, and other physiological changes can have a substantial impact on antibody staining patterns. These measurements were all taken in tissues deemed normal or from patients without known disease. enQuire Bio's FSH-beta Anti-Human Monoclonal is available for Research Use Only. This antibody is guaranteed to work for a period of two years when properly stored.